I’m still having trouble getting my second hive to take. As previously described, back in April (Queens Aplenty and Supercedure) I installed two hives. One did great, the other barely had any brood, just four queen cells. I decided to let the hive replace their defective queen themselves through supercedure, and hoped to see brood after the new queen had had a chance to emerge and mate (about 24 days from the time she was laid, which would have been in mid-April). However, when I went in in mid-May, there were still no eggs being laid. To beef up the hive, I swapped over some frames of brood from the stronger hive, including, I thought, some frames of unemerged eggs (on the theory that if, for some reason, I hadn’t gotten a good queen, the bees would make one out of my eggs). I’ve been in once since then and then again today, and I still am not sure I have a good laying queen. There was maturing brood, but I’m pretty sure it’s just the brood I carried over from the strong hive: there are only 2 – 3 frames of them, and they’re all fairly advanced. No eggs at all that I could find. I decided to give transplanting frames of eggs over and from the strong hive and letting the weak hive create their own queen one more try, but, amazingly, I couldn’t find any eggs in the strong hive either! There’s definitely a good, strong queen in there, but I swear I went through all 18 frames in the two brood chambers and found each one either full of developing larvae, capped cells or honey / pollen, but not a single egg that I could see. Now, I know, they’re tiny and easy to miss, but I must have been in there for an hour, carrying each frame out into the sun to get a good gander at it, and I’ll be darned if I couldn’t find a single one. At this point, I’m fighting the inclination to throw up my hands and give up on the weak hive. My plan at this point is to do some poking to see if I can find a mail-order queen (which is probably what I should have done a month ago) and see if she can save the day. On the bright side, the strong hive of Carniolans is going like gangbusters. The first honey super is pretty close to full and the second, that I put on last weekend, is filling up nicely (but still less than 1/4 full, I’d say, very little capping so far). Just want to say I have the same problem! I've got one strong hive and one weak where the queen died early spring. Since then, I've tried to get a new queen going. I know they managed to make two queen-cells, and I guess the first one killed the other emerging queen. Unfortunatly, the "surviving queen" probably died when she was out mating. So, there's still no queen, even though I've been working on it since April. I look forward to hear more about your egg- and queen-situation. I really enjoy your blog! I am a fairly new beekeeper in California and I just discovered you blog which I find really interesting. I'm still learning and really enjoy reading what other beekeepers are dealing with. I'm adding two new hives in April, one Russian and another Italian. So far my biggest hurdle has been dealing with varroa mites. 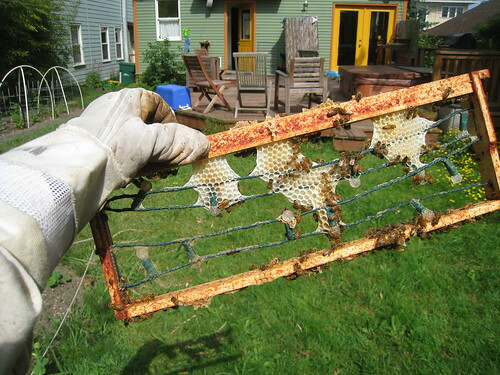 I wanted to be totally organic but was afraid I would lose my one hive completely if I didn't treat. I used Apiguard and it seems to have been successful. The girls were out in force today, the first sunny day in awhile and they looked great. I'm adding your blog to my igoogle page so I can follow your posts. Thanks for sharing so much information.